Fall has arrived! We love exchanging out our flip flops for Converse and hoodies. Let’s not forget — it’s also Pumpkin Spice everything season. From pumpkin butter to the sacred Pumpkin Spice Latte! 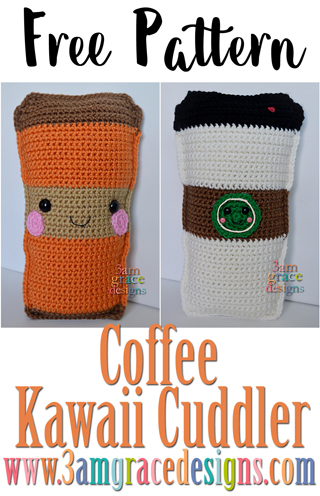 To celebrate, we’ve created a Coffee Kawaii Cuddler. We’ve included instructions to make either a pumpkin spice latte or a regular coffee cup. * Embroider or use puff paint to create mouth. 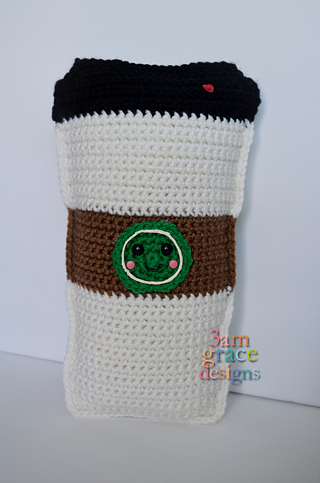 * Align Coffee Cup shape halves so ends of rows match. Single crochet around both pieces to join together. For the variation pictured above, follow the Coffee Cup pattern, changing colors to ivory, dark brown and black as pictured. *Using white puff paint or embroidery floss, create white circle around edge of green circle. *Place 8mm safety eyes as desired. *I used two pink circle brads for cheeks and a red heart brad on the black lid. Feel free to embellish as desired. *Create mouth with black puff paint or embroidery floss.